We are promiscuous with the word love in English. We apply it to people, animals, things, and even abstract objects to the point it becomes a vague and general attitude. In Spanish, classically and even today in most places, the word amor or its verb form amar keeps a more precise and protected, rigorous meaning, even though it is increasingly challenged to expand and become unfaithful like its English cousin. 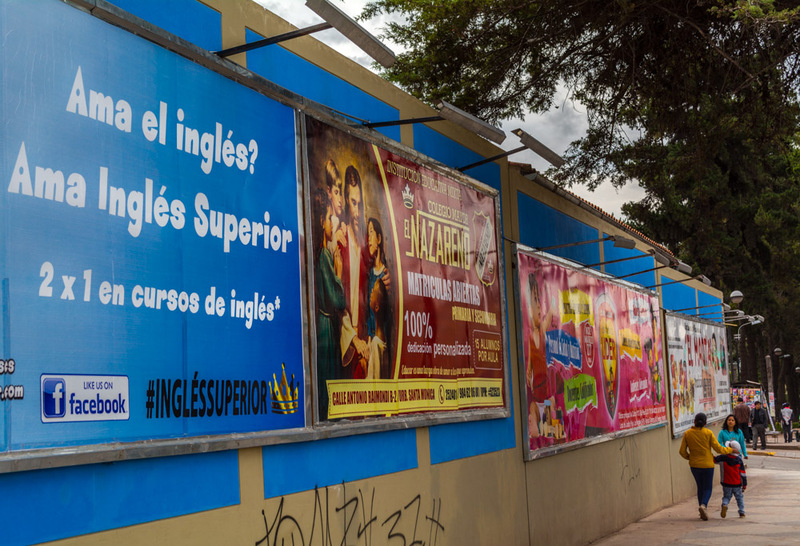 An advertising campaign in Cusco on the main Avenida de la Cultura told people “Ama el Inglés”, love English. This struck me strange, not because of telling people to love the language of the United States, but because it sounded weird to my ear, rather promiscuous, to tell people to love a language. The word amar had been reserved for very close relationships and formal relationships, such as those between spouses while all the rest of the rich language of affect and attachment in Spanish was usable for describing your attachment or desire for a language. Traditionally, the bounds of this word were disciplined by the verb querer, such that mothers tell their children the love them by saying “te quiero” and not “te amo”. Amar was reserved as an expression of the primary attachment, that of spouses, while all others were defined by querer. It is the third definition that hints of what has become the flood of new usages for amar, when the dictionary says: “a feeling of affection, inclination, in giving of self to someone or something”, although it quickly bounces away from that and in the fourth definition says “a tendency to sexual union”, something that is very difficult with things, perhaps. That bliss is what marketers would have you experience with new acquisitions, or things you want to desire. The malls that are populating Peru with each passing day are temples to this new attitude of desiere, want, and all too brief fulfillment, called amor. You can see this marketing (and political) message in an advertisement for Inca Kola found in the luggage retrieval area for local flights of the Lima Airport. 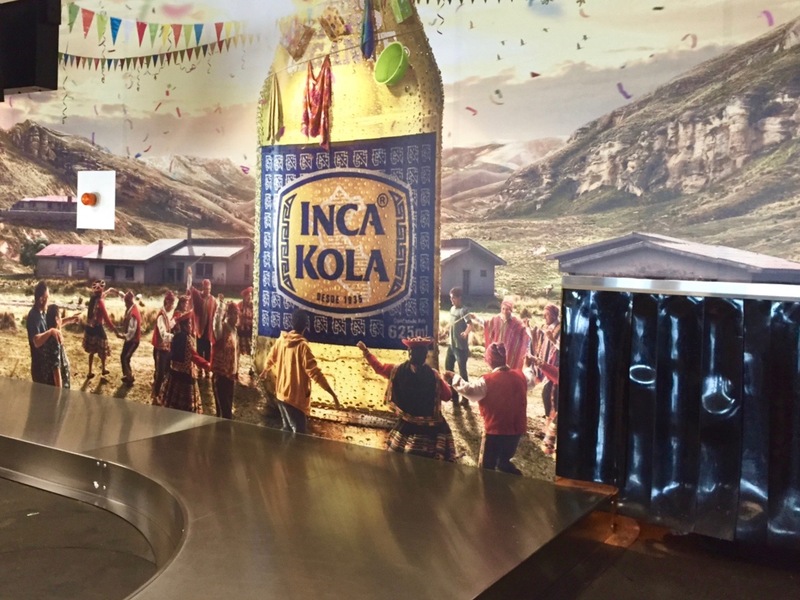 In it, indigenous people along with Peruvians of other classes and ethnicities are dancing around a supernaturally large bottle of Inca Kola at Carnival, as if it were a yunza tree. The bottle of soda is the object of desire, like the tree filled with gifts, which will come down and bless all with drink, while reworking social order such that solidarity and unity of action and object brings all Peruvians together as one. But it is more, this love should be the way in which people decide and do their lives. Rather than the old “deber,” duty, or the traditional “ayni,” reciprocity, people can follow Argentine singer Facundo Cabral. He said, “Haz solo lo que amas y serás feliz”, do only what you love and you will be happy. As a result, finding what you love becomes a quest, helped by the marketers. This new amor, involves attaching Spanish to the language of international capitalism and marketing, the English the billboard asked them to love, in an economic and political order akin to that of old that tied English first to Latin and then to Norman French before it became its own language and not merely a regional dialect or set of dialects. In the verb amar, and all that goes with it, we may see even a powerful language, such as Spanish, spoken as a native language by billions, becoming subordinated to the profligate yet controlled economic and political system centered in English. Though advertising and popular usage is encouraging people to love goods, and to love their country, as well as a foreign language, most people I have heard still use amar more restrictedly when it comes to family and romantic relationships. Who knows what the future may bring? Promiscuity of love for marketing’s sake may increasingly reign.